My kids love pets. They have tried very hard to convince us we need more. Pet rabbits, pet birds, puppies -- you name it, they'd love to have them all. But, how would they feel if THEY were the pet? After reading the following two books, I'm sure they look at pet ownership a little differently. These are just two of the books we read this week, both about pets. 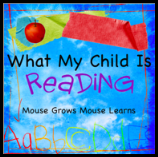 What you are reading with your children? For a spoiled girl who has everything and gets her way nearly always, a real brontosaurus for a birthday present does not sound like an unreasonable request. Not at all. Surprisingly her parents say, "No." What's a spoiled girl to do? The obvious! Say, "Foo on you" to her parents and go into the forest alone in search of a brontosaurus for a pet, all the way merrily singing a little made up ditty, "I'm gonna, I'm gonna, I'm gonna, gonna get / A bronto-bronto-bronto Brontosaurus for a pet." Lo and behold, she stumbles upon a brontosaurus (Mr. B) who has his own ideas about pets, namely, that he intends to make Lulu his pet. "Is that where a brontosaurus would live? In a forest? I'm afraid that I'm not absolutely sure. But since I'm the person writing this story, I'm putting this brontosaurus in a forest, along with a lot of other wild beasts that I'm absolutely sure did not live on Earth when dinosaurs were there." Fresh, original and a bit quirky, the whole book is highly amusing -- there is even a half chapter (chapter eight and one half) and three alternate endings. Sometimes the chapters are only a few paragraphs long and we really flew through this book quickly. We love Lulu's character. She likes to eat pickle sandwiches and carries a bottomless suitcase kind of like Mary Poppins' carpetbag. And, even though she starts out as a snotty little girl, she does learn some manners after her encounter with the dinosaur. Lane Smith's pencil illustrations are a great fit for this book and have a really interesting look that show the rough texture of the pastel paper through the drawing. Wood grained page borders give a decidedly forest like feel to Peter Brown's newest picture book, Children Make Terrible Pets. And for good reason. A sweet, adorable tutu-wearing bear named Lulu discovers a little boy in the forest and decides to take him home and keep him as her pet. Her mother warns her that "children make terrible pets," but Lulu insists she is up to the task of taking care of her squeaky little critter. While the two have a lot of fun together, Lulu discovers that taking care of a little boy is harder than she first thought. "Squeaker" the boy isn't very easy to potty train, gets into a lot of trouble, and Lucy has second thoughts about her choice of pet. Children Make Terrible Pets is a cute and clever story perfect for toddlers on up. It has eye-pleasing illustrations and a funky design, exactly the sort of thing you'd expect from the talented Peter Brown. I love the dialog bubbles and the text that looks like it's stuck to the page with turquoise sticky notes. My kids thought it was funny that the only thing people said in the book is, "Squeak." As a parent to young children, I can really sympathize with poor Lulu. Trying to take care of a stubborn child certainly is not all fun and games! And children will look at taking care of their own pets in a whole new way after reading this one. Brown's book made it onto the distinguished and recently released New York Times Best Illustrated Children’s Books of 2010. Ooooh - what fun looking books! I love your blog! 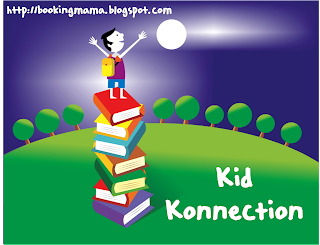 Visiting from What My Child is Reading and entered your blog hop. I had some time to browse and you have some great things here :o) I was able to find Desmond in our library hold section so we'll be getting that. Oh and thanks for the other blog hop links. Children Make Terrible Pets sounds cute, I must look for it. Children Make Terrible Pets sounds fantastic. I just love the cover! I have to check out the Lulu book. I love Judith Viorst and Lane Smith. What a combination! Thanks for sharing! We'll have to check both of those out. We read a similar book recently called Guess What I Found in Dragon Wood (about a dragon who finds a boy). We are having a Holiday Bloganza where each blog participating offers one gift to the pot. One entrant will win ALL the prizes. They MUST follow each blog to win. Extra entries will be to follow on facebook, twitter, networked blogs, etsy... ect. Good way to get more followers' Check it out. Please read carefully, this is not a giveaway for one blog... many blogs are linking up then on November 22 we will offer all the prizes for a HUGE GIVEAWAY!! I love stumbling on completely new books on your blog! I have to add both of them to my reading list - they sound great. Thanks for joining WMCIR! 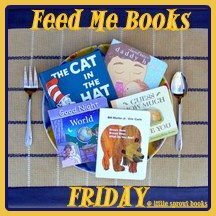 Thanks for linking up at Feed Me Books Friday (and for including the button)! Hope you'll return this week! We've been looking for shortish chapter books to introduce my son to - what a fun find! It will be on our libray list! Thanks! 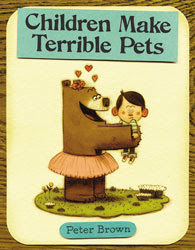 just picked up a copy of children make terrible pets @ the bookstore recently. I loved it! My nephew came home from school the other day, though, with a book called, "Pet sized dinosaurs." He told me excitedly, "Look! You can get a dinosaur as a pet!!" Hope your kids don't get a pet dinosaur! !